A useful feature of Google Gmail is the ability to access other mailboxes. Use Gmail to access a mailbox that doesn’t support webmail access. Useful if you require remote access (e.g. when on holiday). Import email from another email account into Gmail. Use Gmail to consolidate email from multiple accounts . To illustrate imagine you have your standard email mailbox with a Gmail address of me@gmail.com. You can logon to this account and under the settings section you can configure it to check other email mailboxes. Let’s assume you have an account me@mydomain.com which you can access using either POP3 or Imap4, but not using Webmail (i.e. a browser). You can configure your Google Gmail account to access this mailbox and place the email into your Gmail mailbox. Not only that, but Gmail shows the email is from a different account by assigning it a label using the email address. Here is how it is setup under accounts and Import. Notice that it tells you the last time the mailbox was checked. To configure the address for the POP3 server/username/password as well as other settings click the edit info button in the “check mail using POP3” box. Note: You should always leave a copy of the message on the server! It is not possible to configure how often Gmail will check the other mailbox, but it is possible to manually check the mail using the check now button. You need to configure the sending SMTP server to use when you reply to a message sent to that mailbox. TIp! 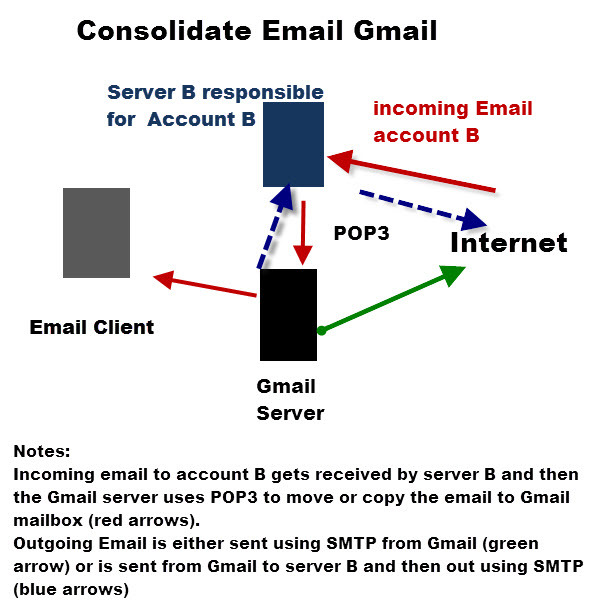 -Use the Gmail SMTP server as it is easy to setup. You can access this setting using the edit info button in the right hand side of the “send mail as” box. Periodically the Gmail server will connect to the mailbox of your other account and download the emails. If this is the Gmail account then they appear in the sent items folder just like email that you send from the Gmail account. You can use your Gmail account to consolidate email from multiple email accounts into a single email account that you can access using web mail. Q- I’ve configured Gmail to read emails from my other account but I find that there is a noticeable delay when I send an email to the account and that email appearing in the Gmail folder. Why? A- This is because Gmail checks for email on a periodic basis, and you have to wait for it to check before it receives the email. Q- I normally access my other email account using IMAP will this still work as Gmail is using POP3.